Cover: Maxim Vorobiov. The Oak broken by the lightning. 1842. Richard Wagner made himself celebrated as a great opera composer and a reformer of the musical theater. However he did not leave behind many significant works in the genre of symphony, overture, or symphonic poem. The only exception is his Faust Overture (1840, second edition - 1855). Yet the scale of the orchestral episodes of his operas, the role of the orchestra that cements the leitmotif fabric of the music and the profoundness of the symphonic synthesizing make Wagner one of the greatest symphonists of the post-Beethoven period. The outstanding symphonic fragments of his operas represent a great independent value and continue to live on a concert stage. Wagner began to compose his early opera Rienzi in Riga in 1838 and completed it in Paris in 1840. It's a five-act composition in the style of "big French opera" of Gasparo Spontini or Giacomo Meyerbeer. There is no a system of leitmotifs as such in the opera. Nevertheless some of the motifs reappear in most important episodes again and again. The Overture is based on the themes that in one way or another are connected with the protagonist of the opera. After a slow introduction a fast episode follows in the form of sonata. The choruses of the Romans in the finales of the first two acts of the opera express heroic spirit, resolution, and the readiness to perform an exploit. (It's the theme in the main part and one of the themes in the finale. Another theme in the finale of the second act for the first time in the opera sounds in a "two voice unison" of Adriano and Irene.) The theme of Rienzi's prayer dominates the prelude to the fifth act and becomes a secondary part of the sonata form (in the words of Boris Levic, a typically Wagnerian melody). It will later echo in his mature operas (for example, in overture to the Mastersingers of Nurenberg). Prelude to Lohengrin Act 3 (1845 - 1848) is the most joyous piece of the opera that probably became the composer's first true masterpiece. The brilliance and grandeur contrast both with the somber second act of the opera and with the beginning of its introduction (ethereal beauty of Grail). The mood of the fragment is reflected in two themes which go one after another and set off the form. The theme of the middle fragment continues the march movement. While retaining the connection with the themes of the main fragment it at the same time anticipates the theme of the wedding march into which the interlude flows. Tristan and Isolde, as Romain Rolland once put it, resembles a high mountain that towers over all other poems of love. The opera is based on an ancient legend that was many times adapted and interpreted by poets and musicians in the Middle Ages. Minnesinger Godfried of Strasbourg's version underlies Wagner's opera. The ancient legend here is "enriched" by philosophical concepts of Arthur Schopenhauer (as presented in his work The World as Will and Representation) but also by Wagner's personal love story with Matilde Wesendonk (five romances on Wesendonk's verses sound like sort of etudes for the opera). Wagner's opera consists of several scenes turning one into another (with only caesura between the first and second acts). The leitmotifs sound mainly in orchestra. Nikolai Rimsky-Korsakov described Tristan and Isolde as "very rich polyphony that sometimes reaches fantastic beauty and plasticity…Exceptionally elegant style with extreme degree of tensity". The main leitmotifs of the introduction, "languor", "loving glance", "the magic of love", "the ecstasy of love", grow from one to another and represent the distillation of the style of the opera. "The circular architectonics" of the introduction with the music developing to its culmination and then coming back to the starting point reflect the infinity of passion and the futility of languor of love. The introduction is often performed in concerts along with the final episode of the opera, that of Isolde's death. (There is also its piano version made by Ferenz Listz.) These two episodes are bound with one another by thousands of threads that go through the finale of the first act and a long duet in the second. The leitmotif of "the death in love" dominates the latter. The Ring of Nibelungs remains possibly the highest point in symphonic tendencies of Wagner's music of which we spoke above. Some of the orchestral episodes became the symbols of the Wagner's music. Act 3 of The Valkiries, the second opera of the cycle, commences with the famous Flight of the Valkiries. "What a grandiose, wonderful picture! One can picture in one's mind these savage women giants flying with thunder in the clouds on their magic horses", Piotr Tchaikovsky wrote in a letter to Nadezhda von Meck. The leitmotif of valkiries and their belligerent war-cry sound progressively growing in volume. This war-cry is performed by chorus in opera but Wagner wrote orchestral version too. This leitmotif goes against the background of passages and trills of the string and wind instruments (depicting the blasts of wind and the wail of thunder) and skipping figures of bassoons and French horns depicting the clatter of horses' hoofs. The symphonic poem Forest Murmers creates the basis of the act 2 of the opera Siegfried that is the third opera in the tetralogy. In opera the music of the poem is dispersed throughout the act, it sounds seven times. For the concert performance all the episodes are collected together. The mysterious trembling rustle of the German forest comes as a continuous image in the German folk poetry and romantic opera, particularly in operas by Karl Maria von Weber. Against the background of flickering strings not only the leitmotifs of Siegfried's love of nature and, for the first time, a motif of a bird sound but also leitmotifs reflecting the history of Velsungs. The motif of sufferings of Velsungs reflects Siegfried's incessant dreams of mother. The leitmotif of fire anticipates Siegfried's trials. 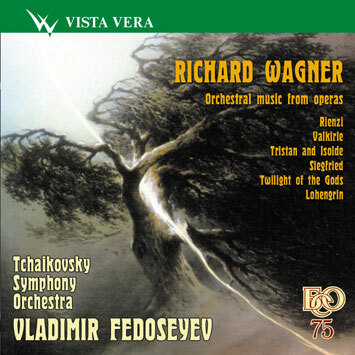 The funeral march from the opera Twilight of the Gods is a mighty and artistically convincing piece of music that could be compared with Beethoven's Symphony No 3 "Eroica". This is, without exaggeration, the tragic culmination of The Ring. The procession with Siegfried's body comes as a grandiose completion of the thematic material of the tetralogy. "The themes of the March present sort of a musical genealogy of the main character. There's a motif of Velsungs, Siegfried's parents, with their love and sufferings. There's a motif of a sword that Sigmund extracted from the trunk of the ash-tree. And there's a motif of Siegfried love for Brungilda" (Mikhail Druskin). Altogether there are twelve leitmotifs in the March. Probably the main of them, apart from those mentioned above, is the motif of the fate and death. The March is written in an unconstrained sonata form with introduction and finale. The logic of its development dictates the departure from traditional iteration of leitmotifs. Instead the composer alternate motifs with similar content.